Firstly my real name is Helen. Black Dress is the title of a song by the Aussie band Kisschasey who are absolutely awesome! 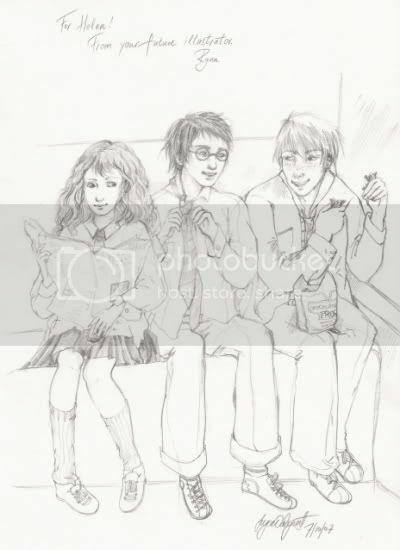 This fabulous picture of Hermione, Harry and Ron was drawn by my mate Iryna who, I think you'll agree, is very talented. Thanks Ryna! You rock. She's going to be my illustrator one day! Well let's see, I'm from Australia, I live in Melbourne and it's no secret that I'm a Harry Potter nerd. Yes it's the sad truth but anyone who is actually reading this probably shares that label with me. I'm not very tall, but I look like I could belong to the Weasley family. Maybe I'm a 7th cousin 6 times removed or something. Fingers crossed! I only recently started writing fanfiction which is really good practice for my writing skills. Hopefully one day I'll be able to create characters of my own, but for now, let's just stick with JK's brilliant creations. I love all things Harry/Ginny and I hope you like my story(s). The Best Mistake of My Life is my pride and joy. I have other stories in the works which will hopefully be up soon, but my main focus is BM. There is so much for the future of the story and I'm so excited to get it out there. Be patient for the updates. I know I take a while, but I do try not to be awful. When the seventh year Gryffindoors are given their 'talk', it sparks some interesting conversation amongst the teenagers.